Granada Tile's Sofia tile design, installed on walls, provides a stunning backdrop for the tapas served at Black Bull in Chicago's Wicker Park neighborhood. Photo courtesy Joseph Davis Castleberry. At Granada Tile, we love seeing how our clients incorporate our sensational cement tiles in new and exciting ways. Don’t get us wrong—we love the backsplashes and floor tile installations that we see—but we go gaga when we see unusual cement tile installations. Take a new Chicago tapas place, Black Bull. The restaurant bills itself as a hidden gem, and it is in more ways than one. Its big draw is its fabulous assortment of tapas and wine, but we think the space’s design is aces too. With a zinc-topped bar and classic Thonet-inspired chairs, it immediately conjures up an out of the way bôite in a fabulous European locale. 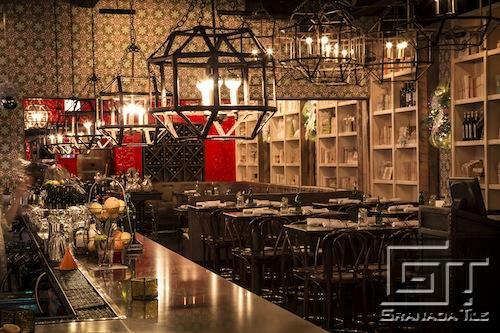 Fun, industrial touches are at play too, namely the wonderful cage-like chandeliers hanging from the ceiling. 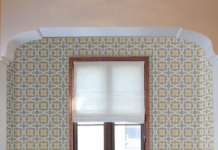 Of course, given its deep Spanish roots, it’s no wonder Granada Tile is in the mix, since cement tiles were especially popular in both Spain and France in the 19th century. So, on the walls, our Sofia cement tile design appears. As you might have guessed, we absolutely love this idea. Instead of being covered in wallpaper or paint, the concrete tiles offer both fabulous color and glorious texture. 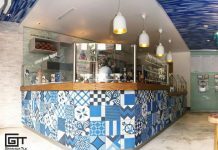 The tile installation proves once again that cement tile works in just about any application you can think of. What’s more, the bight colors of the pattern play off the heavier shades of the furnishings ensuring a truly lively experience. Headed to Chicago soon? Be sure to check out Black Bull. 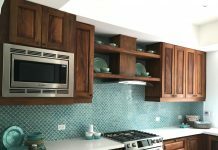 Planning a tile installation project? Be sure to check out our interactive Echo Collection catalogue for more great cement tile inspiration. And, if it’s this particular take on Sofia you’ve got your heart set on, you’re in luck: this tile design happens to be one our in-stock patterns. Next articleGet Inspired: Big in 2014!